Preview Flower Frames & Giveaway! a collection for capturing and preserving memories of past days. We are so excited about this release, and we can barely wait to take part of all the upcoming Flower Frames projects! Of course we want to share this excitement with all of you, and therefore we are now offering you the chance to win these brand new papers! 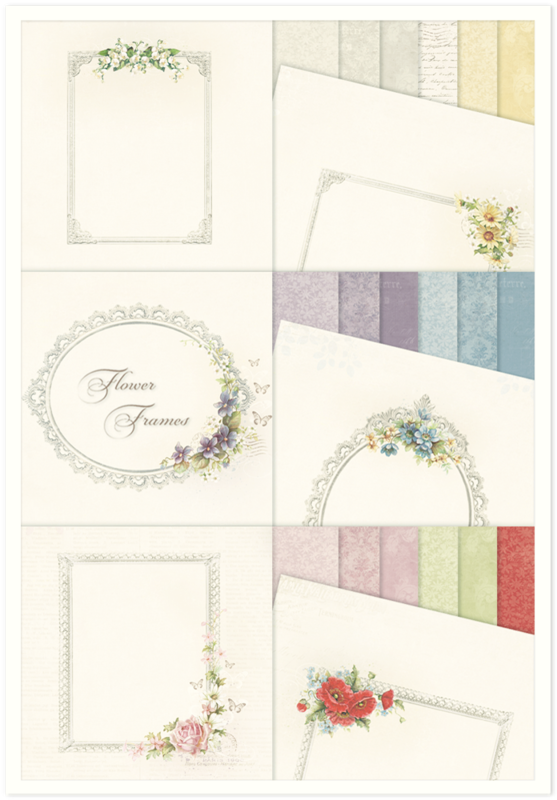 All you have to do to have a chance to receive a complete collection of Flower Frames in 12×12″ and 6×6″, is to leave a comment on this blog post, telling us your first impression of this paper collection. This giveaway is open for entries until Friday November 22 and we will randomly choose a couple of winners that will be announced by the end of the week. Make sure to share the news of this giveaway in as many places as possible, becuase the more comments we receive, the more winners we will pick! Ik verbaas me er steeds weer over hoe geweldig de nieuwe collecties van jullie ontwerpers zijn. Ik vind het ongelofelijk fijn om met jullie papier te werken. Het brengt me steeds de prachtigste resultaten en de complimenten zijn dan ook niet van de lucht. Ongetwijfeld zal ook deze flowers and frames tot één van mijn favorieten gaan behoren. What a beautiful collection, stunning flower frame`s and gorgeous colour ways of coordinating papers. Oohh…wat mooi is deze collectie weer. Prachtige kleuren en bloemen! Elke serie van Pion Design vind ik prachtig. Zo ook deze weer. Zo heerlijk voor vintagekaarten/creaties. We are so happy and thankful for all your amazing, wonderful collections!! It’s always such a pleasure to work with them!! Since the moment I discovered Pion design, it’s one of my favorite papers!! Always fine, gorgeous and lovely decorated. Amazing little details, so precious! The new one looks very, very nice. Love the flower frames and the colors looks wonderful, the soft green and yellow. All these soft tones, perfect for the new season! Wish you by now a very nice end of the year! What a beautiful Paper collection!! Love these! Åååh, “happiness and love again for me / us ♥♥ 🙂 It looks like another beautiful collection, girls, and I have to agree, it reminds me of the Victorian style, with the damask’pattern, and frames with beautiful carvings, and the most beautiful flowers from the red Poppies, -violets-,to delicate pink roses, and lilies of the valley ..soo beautiful, and I love it .. Such a BEAUTIFUL, WONDERFUL, DELIGHTFUL collection! Virkelig, virkelig smukt design. Glæder mig til at “se det med hænderne” Tak for chansen for at vinde dette lækker papir. Papper som väcker kreativiteten och lusten att skapa. Once again you’re coming out with a collection of papers that are just adorable! I love the colours and the flowers :-). Åhhh, disse var bare så vakre! They are amazing collections of papers. I nedd nothing more that to uork with these papers. Your collections of papers have pure magic! This magin I transform into cards. I am very new to Pion Designs and have only recently discovered them through the amazing work of Anne Rostad one of your Guest Designers. As I am very much a fan of everything vintage, these new frames look amazing and I would love to have the opportunity of trying them out for myself. Thank you for this chance to win! Hi, Pion Designs is new for me, and I have to say I’m in love with the papers, they are so elegant and delicates, very sweet! The paper looks lovely, gorgeous collection. Hi, I am new to this Blog as I found it through Anne’s Paper Creations and so glad that I did. Absolutely love what I am seeing and all the inspiration. The Flowers and Frames collection is so tranquil and lovely. I really like the color scheme as I am partial to the lighter tones. Thank you so much for a chance to win the collection. I like this collection!! Beautiful spaecial for my wedding photo’s. Whatever a beautiful paperline is this. The colors are juste the ones that i lové to word with. Oooiiii …. hvor er de bare fine! Det første jeg lagde mærke til var de smukke, blide farver! oh, vad fina dessa papper är, gillar de enfärgade pappren med mönster ton i ton och blomramarna är helt fantastiska!